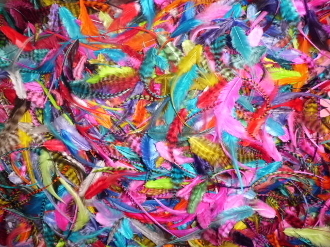 We are now selling our famous MINI feathers by weight instead of quantity! This means better value than ever for our customers, you will receive over 300 feathers per 10 grams on average, ranging from 2-6 inches in length - Mini feathers are PERFECT accents to short hairstyles or longer feather bundles. You can create your own fascinators, earrings, or braiders using whichever colour combinations you can dream up! As this is sold in bulk, we cannot substitute any colours. Ie, no "all reds" We are able to send half and half natural and rainbow colours, just mention your preference when checking out. This also comes with 25 of our silicone-lined aluminum micro rings, of your choice of colour! These rings allow you to simply crimp our feathers onto your own strands of hair. Looks great on pets too!